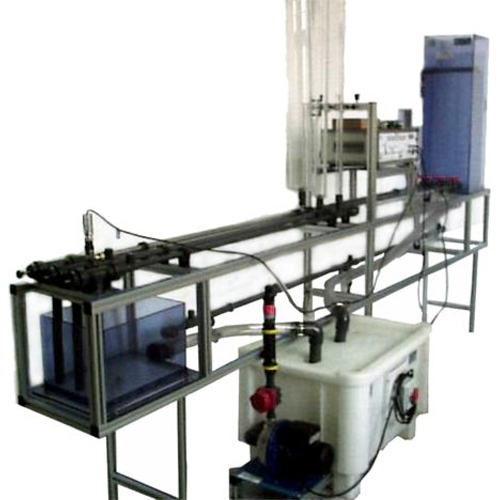 The unit is designed to demonstrate the effects of the instantaneous or gradual variation of the speed in a fluid. It is possible to study the hydraulic ram, which is the consequence of a quick change in a fluid speed. This Computer Controlled Unit is supplied with the EDIBON Computer Control System (SCADA), including: Control interface Box + Data Acquisition Board + Computer Control and Data Acquisition Software, for controlling the process and the parameters involved. Anodized aluminium structure and panels in painted steel. Diagram in the front panel with similar distribution to the elements in the real unit. Centrifugal pump: 0.37kW, 30-80 l/min at 20.1-12.8m., single-phase 220V./50Hz. or 110V./ 60Hz. Tank capacity: 140 litres approx. Membrane type flow adjusting valve. Constant level tank, manufactured in PVC glass, which supplies water to the circuits for making the practices. Discharge tank, manufactured in PVC glass. There are four circuits for essays: the first one in stainless steel; the second one in PVC and with the same diameter that the previous one; the third one in PVC but with a bigger diameter; and the fourth one in PVC, interchangeable with the third one when checking the effects of abrupt expansions in pipes. Valves to select the circuit. 2 Pressure sensors, which can be placed in any of the 12 possible points of the four circuits. Control interface box with process diagram in the front panel and with the same distribution that the different elements located in the unit, for an easy understanding by the student. between the control interface box and computer. parameters involved in the process. Calibration of all sensors involved in the process. Real time curves representation about system responses. Storage of all the process data and results in a file. Graphic representation, in real time, of all the process/system responses. All the actuators’ values can be changed at any time from the keyboard allowing the analysis about curves and responses of the whole process. All the actuators and sensors values and their responses are placed in only one computer screen. Shield and filtered signals to avoid external interferences. parameters, at any moment during the process. Real time computer control for pumps, compressors, resistances, control valves, etc. Open control allowing modifications, at any time and in a real time , of parameters involved in the process simultaneously. Three safety levels, one mechanical in the unit, other electronic in control interface and the third one in the control software. PCI Data acquisition board (National Instruments) to be placed in a computer slot. Bus PCI. Analog input: Number of channels= 16 single-ended or 8 differential. Resolution=16 bits, 1 in 65536. Sampling rate up to: 250 KS/s (Kilo samples per second). Input range (V)= 10V. Data transfers=DMA, interrupts, programmed I/0. DMA channels=6. Analog output:Number of channels=2. Resolution=16 bits, 1 in 65536. Max. output rate up to: 833 KS/s. Output range(V)= 10V. Data transfers=DMA, interrupts, programmed I/0. Digital Input/Output: Channels=24 inputs/outputs. D0 or DI Sample Clock frequency: 0 to 1 MHz. Timing: Counter/timers=2. Resolution: Counter/timers: 32 bits. Compatible with actual Windows operating systems. Graphic and intuitive simulation of the process in screen. Compatible with the industry standards. Registration and visualization of all process variables in an automatic and simultaneously way. Flexible, open and multicontrol software, developed with actual windows graphic systems, acting simultaneously on all process parameters. Management, processing, comparison and storage of data. Sampling velocity up to 250,000 data per second guaranteed. Calibration system for the sensors involved in the process. It allows the registration of the alarms state and the graphic representation in real time. Comparative analysis of the obtained data, after the process and modification of the conditions during the process. Open software, allowing to the teacher to modify texts, instructions. Teacher’s and student’s passwords to facilitate the teacher’s control on the student, and allowing the access at different work levels. This unit allows that the 30 students of the classroom can visualize simultaneously all results and manipulation of the unit, during the process, by using a projector. Cables and Accessories, for normal operation.